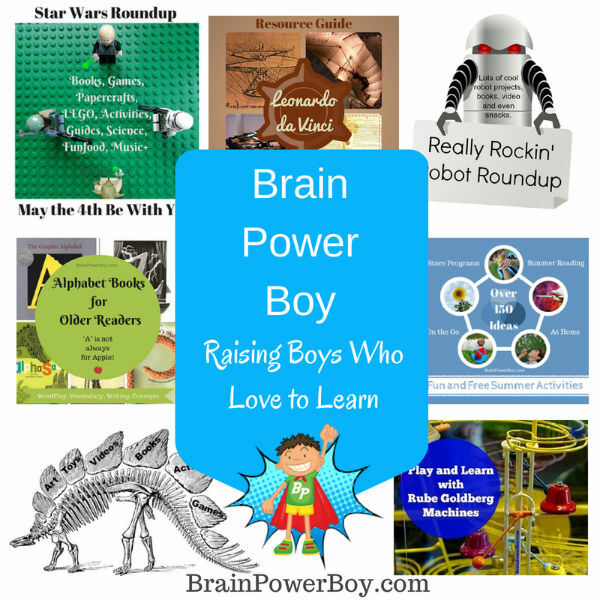 Brain Power Boy is a great place for you to find resources for raising boys who love to learn. Welcome, I am so glad you are here. My name is Sheila and I publish Brain Power Boy to help anyone who has boys find fun and natural ways for them to learn. Learning doesn’t have to be a big struggle. Instilling a love of learning in a boy is a gift that will last a lifetime and I am here to help you do just that. Brain Power Boy covers a lot of topics and they are all related to boys. Girls can also benefit from the information presented here but the focus of this blog is boys, boys, boys! You will find book reviews and the best books for boys, plenty of posts on LEGO, learning styles as they relate to boys, activities for boys, play and natural learning articles, homeschool unit studies (which are Not just for homeschoolers!,) plus some neat toys and games that are great for boys. I also include posts that make us think about learning and the relationship we have with our boys. As far as books, products or activities go I only put things on the blog that I feel are really awesome and interesting to boys. I am not a fan of b.o.r.i.n.g. educational games so it has to have an element of fun and be high quality to make it onto the blog. In other words, I am really picky so that you only get the best of the best. All of the links on the blog pages are blue. When you see a blue link or a green button they are clickable and will take you to more good stuff. I used my son’s favorite colors on the site. They are cheery, aren’t they? There is a search box in the sidebar of the blog in case you are looking for something specific. If you need help finding something feel free to contact me. The light blue navigation bar has all the categories that the blog covers. There are drop down menus there as well for additional topics. The blue links below it are special pages to help you find more on a specific subject. Hope you will check it out. Below I am including some posts or links to categories that you might enjoy. Please take a moment to scroll through this page. Plus, don’t forget to sign up for the newsletter in the box below. Boys’ Learning Styles Overview. What learning styles are and a list of the different learning styles with descriptions. Includes links to individual learning styles. Artist in LEGO Bricks Series. Interviews with LEGO designers and their tips on how LEGO can help boys learn. LEGO Landmarks Resource Guide. A Guide with links to great LEGO builds of the Landmarks of the World. Fun way for boys to learn their landmarks. Cool LEGO. Series book review. Neat books for building with LEGO without having to use a bunch of specialty pieces. Boys Book Reviews on the blog. Is it Nothing to be Happy? Quote and post about worry and the importance of play. Tell Your Boy How Unique He Is Quote and post about helping your boy find out his unique strengths and qualities. How Sleep Affects Boys’ Learning Information on the importance of sleep in a boy’s learning life. All Boys’ Learning Posts on the blog. Homeschoolers use unit studies to study a certain topic in depth. My lists are fun and enjoyable for everyone–even if you don’t homeschool. If your boy enjoys the topic I am writing about, try one of these lists. I’m sure he will have fun with it and learn something in the process. If you have an idea for a new list, let me know. I know your time is valuable and it means a lot to me that you decided to check out this site. Thank you! I hope you will make yourself at home and take some time to look around. I am here to help you! Brain Power Boy is Your Ultimate Guide to Raising Boys Who Love to Learn. If you have any questions, ideas for posts, information you want to share, or if just want to say hi you can contact me here or catch me on social media (see below.) I would love to hear from you. If you like something on the blog, please use the social media buttons to share it with others. Sharing helps me out by showing me what you like and by getting more people to come to the blog so we can build a community of like-minded people who want to share great resources for helping boys learn. Oh, and one last thing–I share a lot of extra information and fun activities on social media. You can follow me on different social media by clicking on the green social media buttons at the top right of the site or by clicking through on these links: Follow me on Facebook, Google+, Pinterest and Twitter. I would love to meet you, so be sure to leave a comment if you pop over to follow. Thanks so much for stopping by. Hope to see you back on Brain Power Boy soon!